An excellent appetizer, great for game day, or as a side project while you’re waiting for that whole chicken to come off the smoker! For this recipe you will be smoking in the 300°F range. If you’re going to cook other things simultaneously, it might be a good idea to do it while smoking chicken or other fast cooking meat. 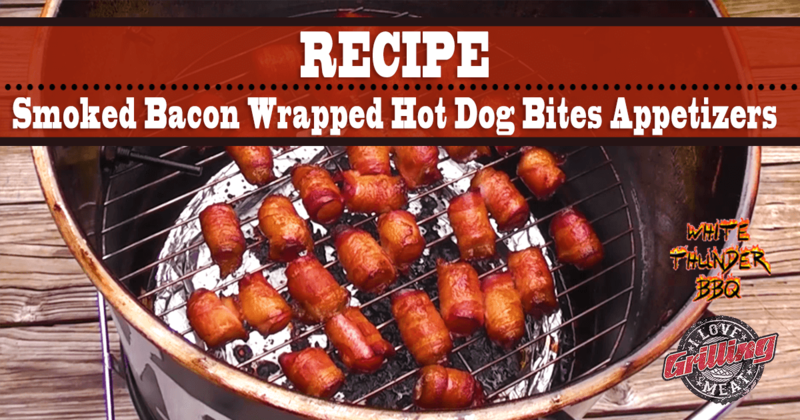 Prepare your ingredients by cutting the hot dogs into quarters and bacon strips into thirds. Wrap a piece of bacon around each piece of hot dog. Everything should stay in place- if necessary, secure the bacon with tooth picks. Place the wrapped dogs on a smoker preheated to 300°F. If your grates are too wide apart, you might want to use a grilling mat or Bradley rack. When they are on the pit, sprinkle the wrapped hot dogs with dark brown sugar. Put on enough for a delicious caramelized crust, but don’t overdo it. When the dogs are almost ready, dip them in your favorite BBQ sauce and place back on smoker for a few more minutes (until sauce sets). When ready, remember to try one first before serving to others because these tasty little morsels will be gone before you know it!